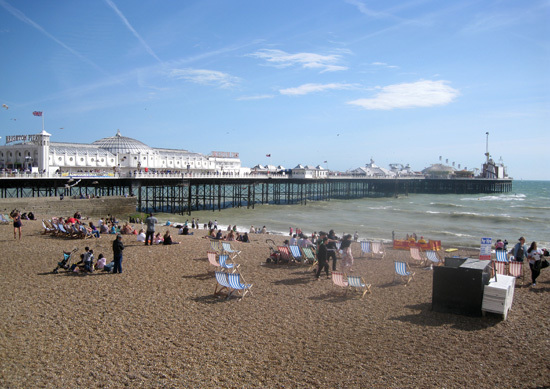 On Sunday we took a day trip to Brighton. My first time there. We only arrived there just after mid-day, with a horribly slow 2 1/2hr drive to get there. 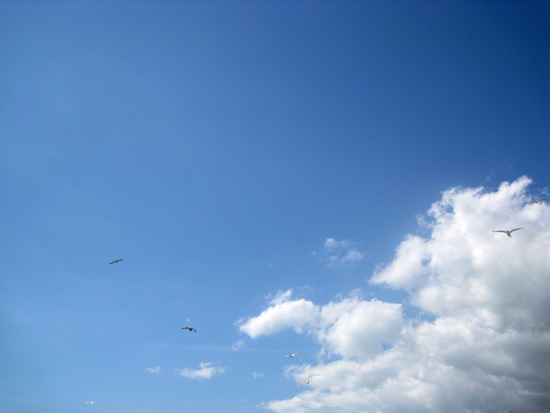 But the sky was blue and there was plenty of sunshine to enjoy...it was a bit windy, but that didn't stop our enjoyment. Lots of steps to jump off of. 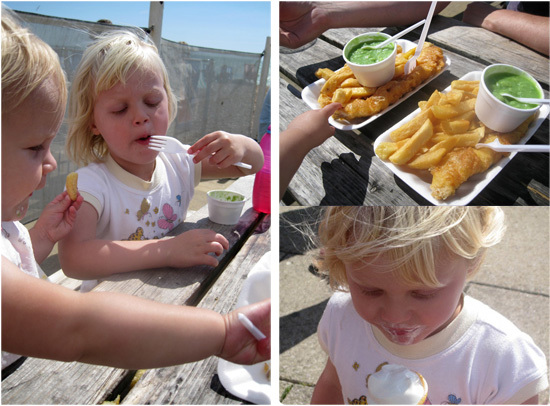 Yummy fish and chips (and not so nice mushy peas) to share for lunch. With delicious soft serve afterwards. 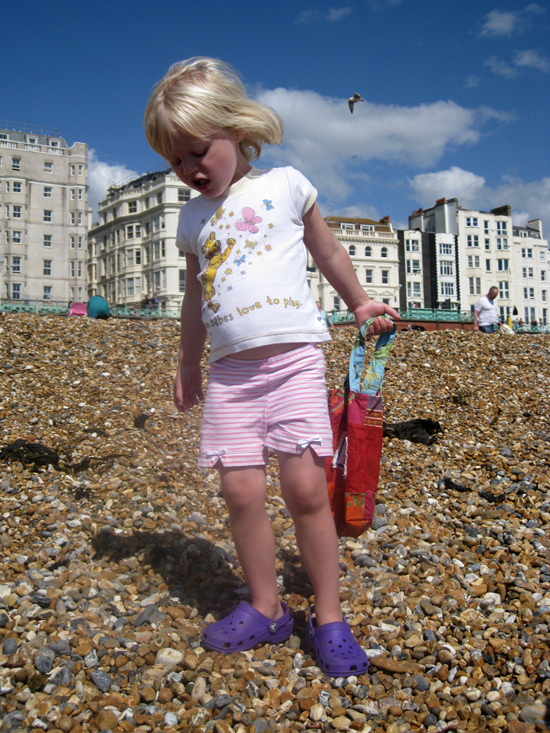 Some 4x4 manoeuvring on the pebbly beach - far too difficult for this wobbly nut to walk on! The pram was pretty much only used to carry the backpack! 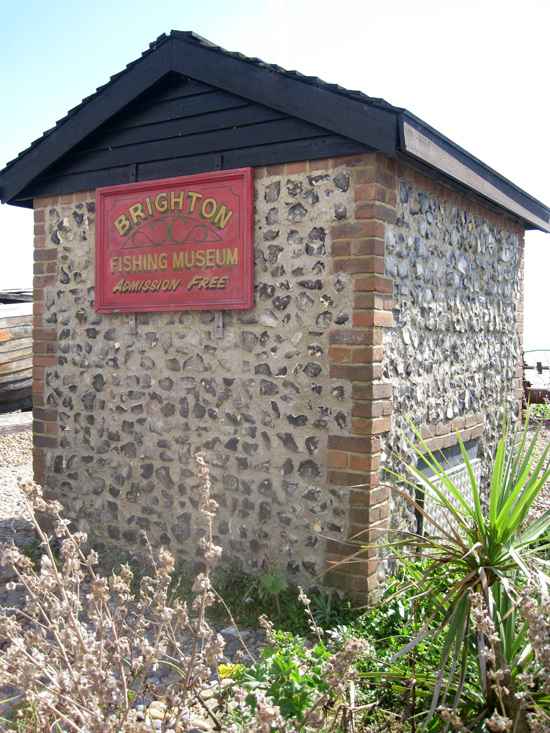 If this building is the actual museum, I sure as nuts hope that admission is free! Looky how small it is! 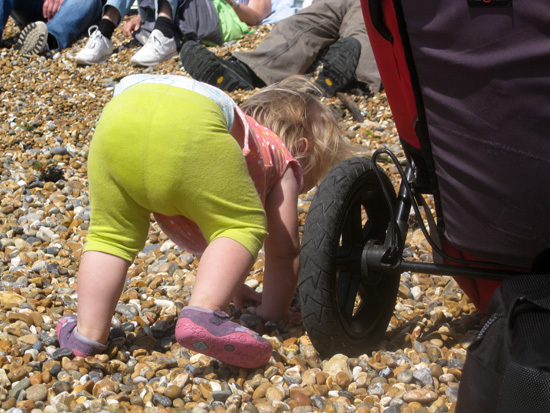 Searching for the perfect pebble takes a lot of concentration. Sweet little purple feet. I love that Chloe is now walking. Enjoying the view and the *breeze* in her face. 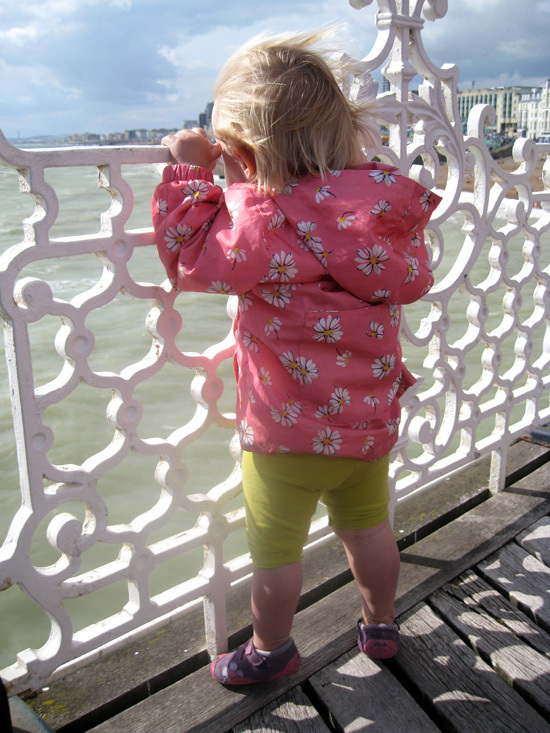 It was so windy that we did not even make it to the end of the pier. 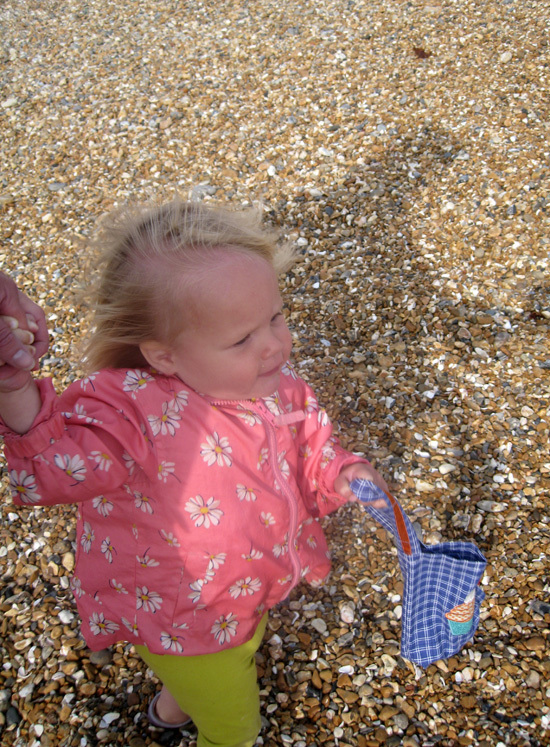 Back on the beach and swinging her bag full of pebbles around rather dangerously. After a long day, everyone was still happy. Now off to find some supper and head on home. It was a speedy trip home, about 1 1/2hrs, but we only arrived home at 10pm! It was a loooong, but very enjoyable day watching the girls have fun. Now I just can't wait to take them to a proper sandy beach...to build sand castles with them. It's Up - It's Up - It's UP!! 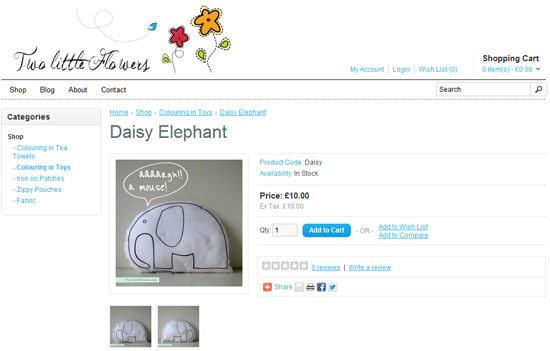 I said that I was excited about my new shop....well, as of a short while ago...IT'S ONLINE!!!! I am doing little back flips about how lovely it looks. Flower Daddy has done an awesome job in making it look so beautiful and clean and simple. Jiggling things here and there to make it look that much better, without me even asking. Make my day and go have a little look see and let me know what you think. Puleeeeese? 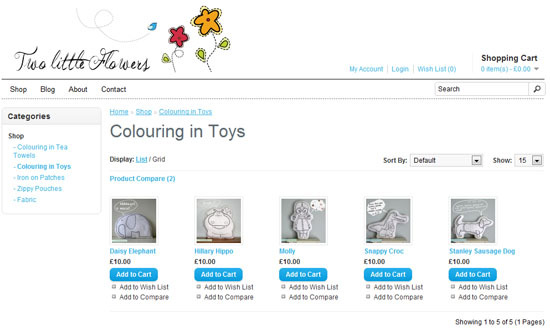 We have been beavering away in the evenings (we, as in Flower Daddy - aka my html guru and I) creating a new Two Little Flowers shop. 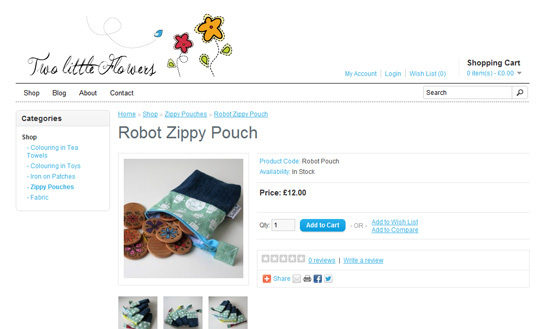 My current shop is a clunky Wordpress shop. It is a bit of a pain to manage...so a new shop is coming sooooon! I am very excited. I have been burning the midnight oil stocking the shelves. We have been checking that links work and that correct information is in place. 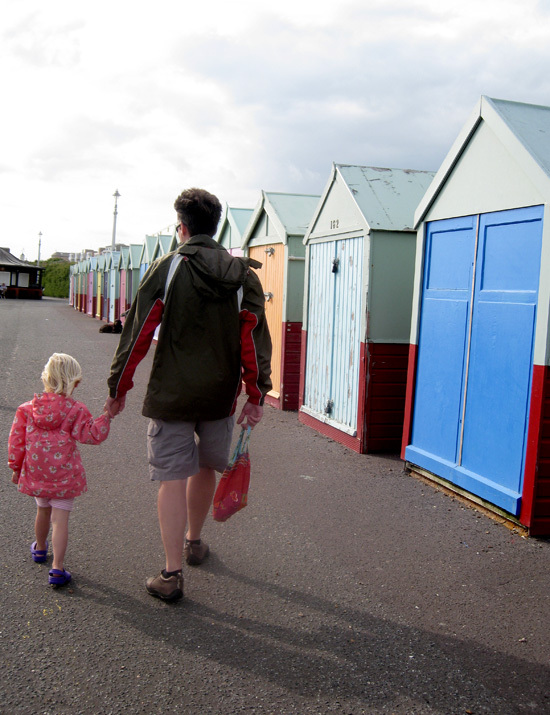 I have been bending Flower Daddies ear about moving, removing and creating links. It gets better...the new shop helps host an affiliates program! You could earn 5% commission on sales that you send to the shop. How exciting is that?! I still have more shelves to stock, but, that can wait until tonight. Right now, I have a new print to go play with while I wait for emulsion to dry on 2 other screens; so best I be off to make the most of my last child-free day this week. Every minute counts! 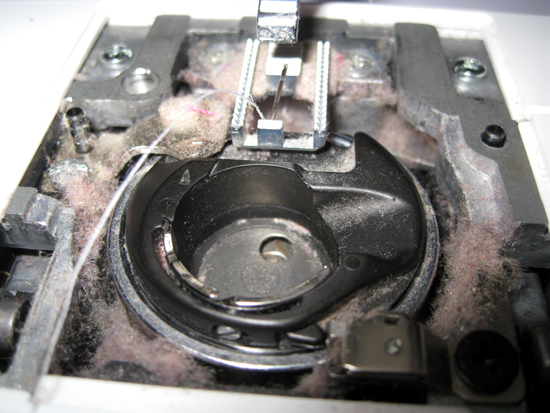 My sewing machine was stabbed...by itself...with it's own needle. I thought that it was going to depart me for sewing machine heaven; or at the very least that I was going to have to pay someone an arm and a leg to fix it. I must admit that I did panic. That is until I realised that there was a little screw just waiting there for me to unscrew and try and fix my beeeeg boo boo. This all happened while I was finishing Chloe's hooded bath towel. Her second towel. I started 2 for her about 8 months ago. 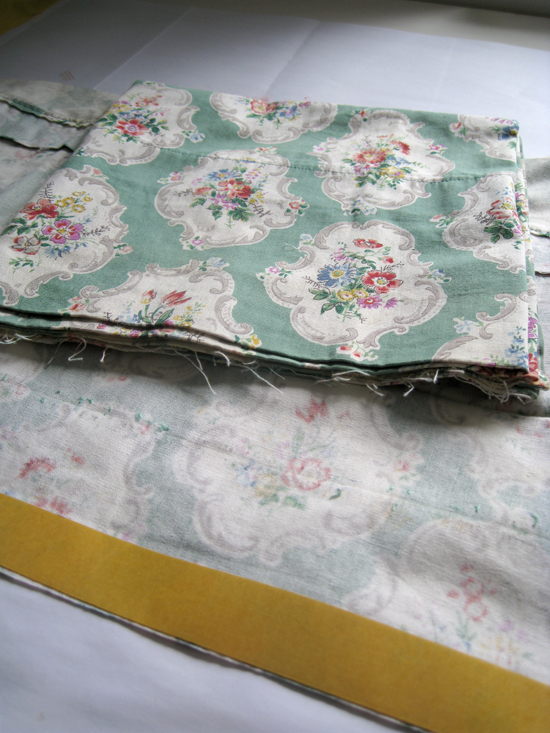 The first one was finished straight away, but this one needed a pretty fabric trim...and so was never finished. Not that a fabric trim is hard work; it just needed brain power and a few minutes of uninterrupted peace and quiet for me to think. Back to my almost dead sewing machine. 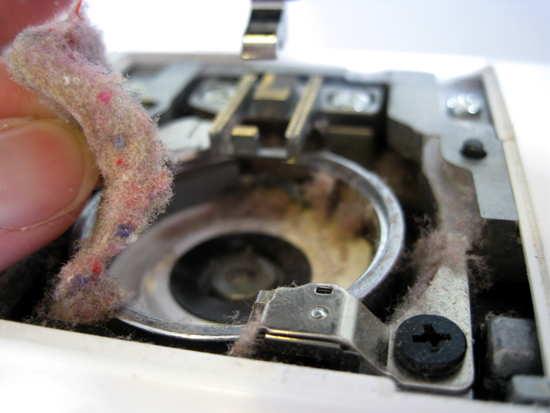 I unscrewed that little screw....and other than the horror of a whole heap of fluff! I found that the needle had bedded itself into my bobbin holder. I have had my sewing machine for 3 years. I am ashamed to say that I have never de-fluffed her. Fortunately the bobbin holder slipped right out. Yikes! Right through the plastic! I am sure as heck happy that was not my finger! Luckily the needled wriggled easily enough out of there. Thank goodness it wasn't actually as bad as it first seemed. I plucked out the wads of fluff and used one of the girls paint brushes to clean out the rest of the fluff. The brush that came with my machine was a tad bit pathetic. The fluff just slipped straight off of it, which meant that any fluff in the places that a little brush could get and my fingers could not would have been stuck there for eternity. Ta dah! All beautiful and sparkly and clean! The purple trimmed towel is Ava's towel. I made hers about 2 years ago. The yellow trimmed towel is Chloe's newly trimmed towel. They each have a second towel simply trimmed with pretty ribbon. 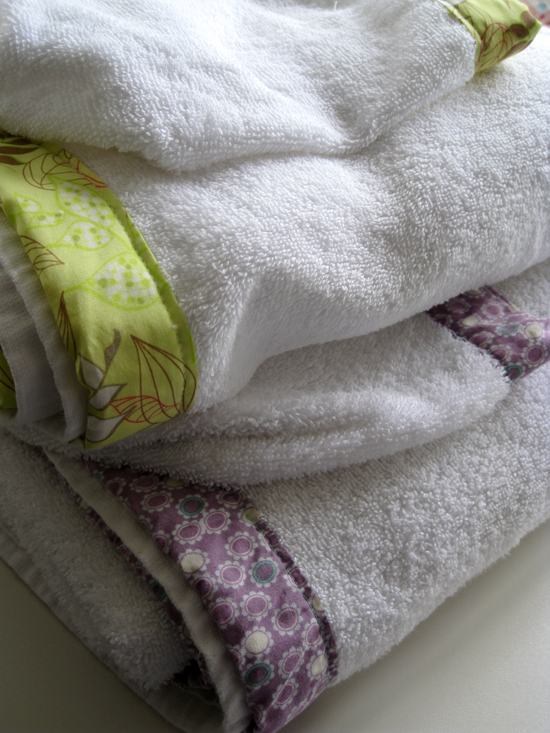 In case you are interested, I used this tutorial for these hooded towels. Just in case you are worried about incapacitating your sewing machine by making these towels - my first 3 made up without a hitch. I think that I was just impatient to get the last 1 finished. Right, you know that I am on the hunt for small but effective gift ideas for Christmas this year. Well. This is the easiest, peasiest gift that you will ever make and is pretty economical too. If you are like me, you will end up making a bunch more for yourself too. Not so economical then! Right, all you need is some fabric, some double sided sticky tape and a pair of scissors. 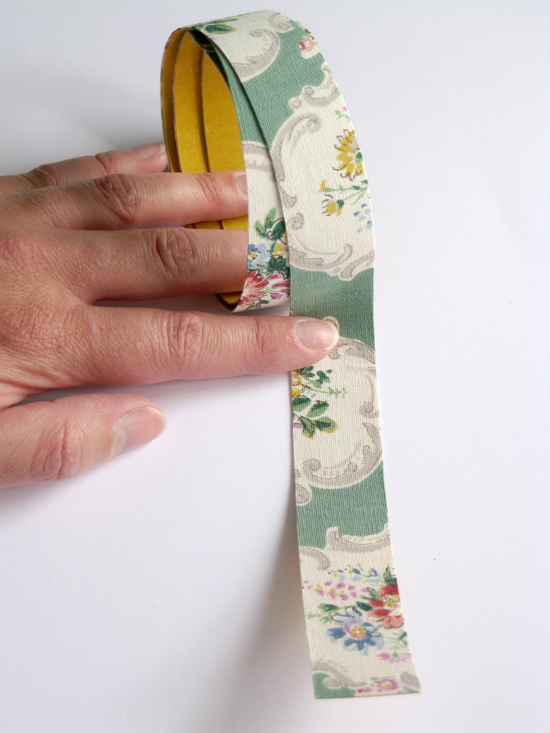 Cut the fabric along the sides of your tape. I used scissors, but you could use a rotary cutter. 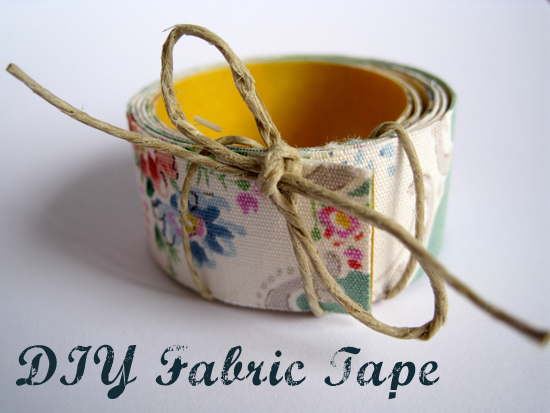 Roll up your tape and tie a ribbon or string around it to keep it neat. Job done! 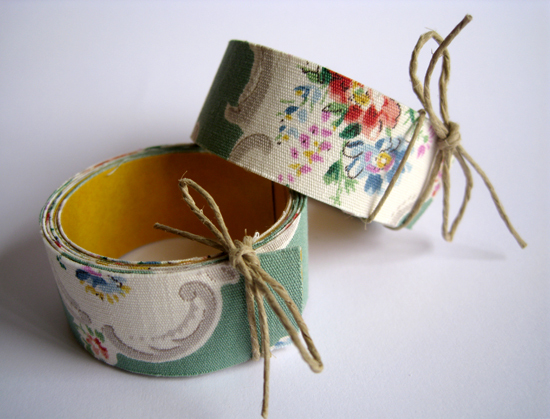 Great for scrap booking, beautifying parcels and packaging, sticking pictures to the wall (ok maybe not such a hot idea considering this tape is permanent - can see Flower Daddy hyperventilating already). 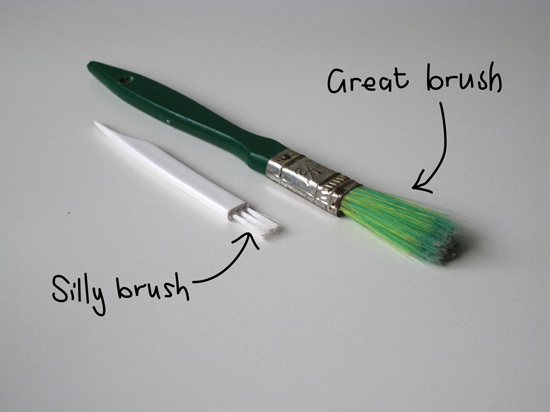 You get the idea - use it for beautifying whatever you fancy perking up.Go and make a heap more...!!! 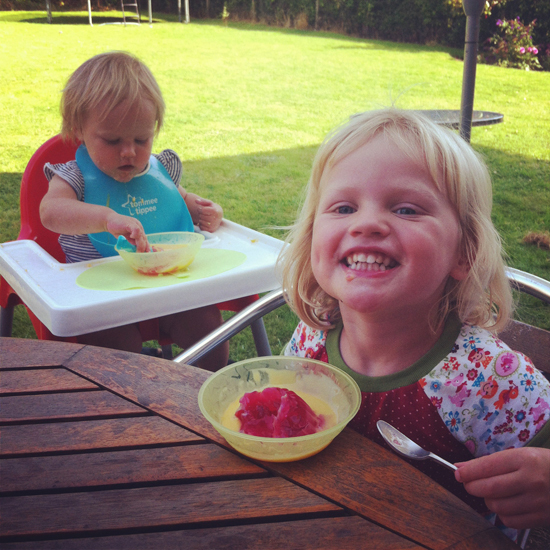 It is already over 2 months since I have been back at work - after a lovely years maternity leave. Working in an office feels so alien to me these days. BC (as in Before Children) I was pretty ambitious; not so phased about conforming with my 21 days annual leave; happy to travel for work; not so happy about working over time; had shelved my craftiness and hobbies; happy to wear a black suit and black shoes; happy to have a business-like handbag...you get the idea. I had worked hard to get to the level I was within the company and was fine with it. That was all good and fine and great. 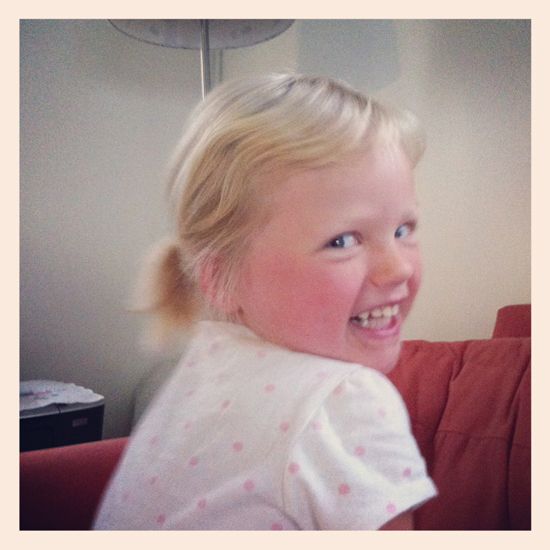 But, I never expected my year off with Ava to mess with my values so much! I remember worrying that I was going to be bored within 2 weeks away from work - NOT! 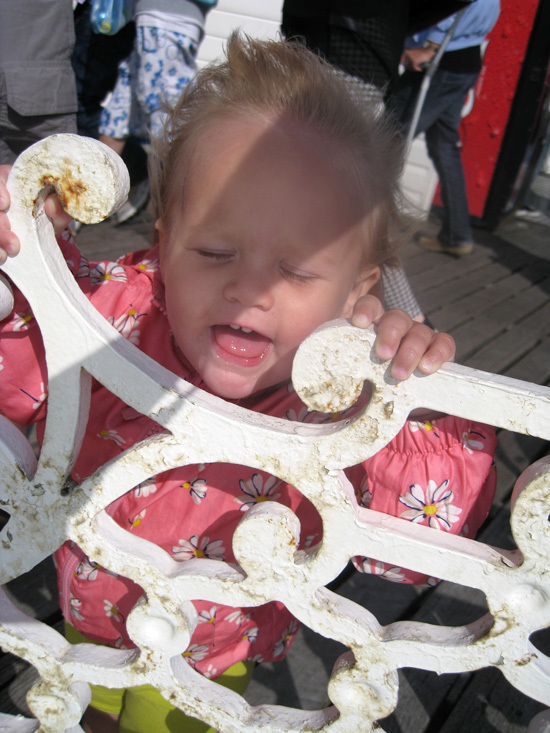 I remember thinking it would be no problem to stick Ava in care while I went back to work 5 days a week - NOT! 6 months into my leave and I didn't really want to go back to work...and was already thinking that a 2nd ankle biter might not be such a bad idea after all. 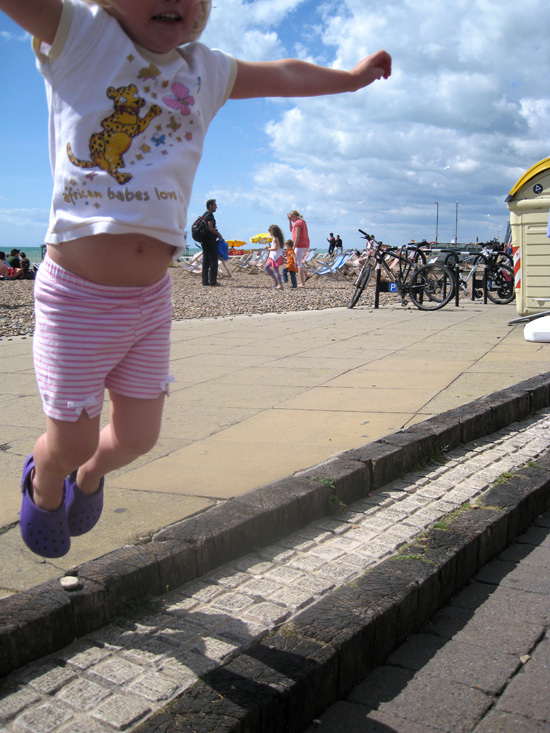 Over 3 years I was off on maternity leave for 2 - with a 1 year return to work break in the middle. There will be no more little people in this house. 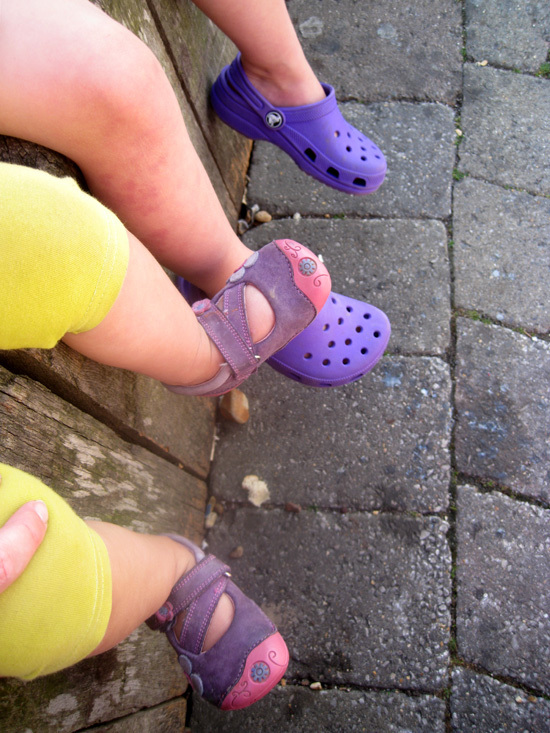 Two little girls is enough for us 2 parents to handle thank you very much. So, no more maternity leave to look foward to. It makes me very sad to think that I won't experience that freedom again. AC (as in After Children) I am still pretty ambitious (but in a very different way); very much bugged by conforming to my annual leave allowance (travelling to South Africa with 2 little people costs a bucket - and 3 weeks away just doesn't allow enough time to visit family any more); not that happy to travel for work (although would if needed); not happy about working over time (it means that Flower Daddy has to pick up the slack); have my fingers dipped into about 10 different crafts; hate black - shoes and clothes and want to live in shorts; use a backpack (can't carry Chloe and hold Ava's hand and keep a bag slung over my shoulder all at the same time); want to be involved in raising our girls - disciplining, being a role model and all that stuff - not leaving all of that to the nursery...the list goes on and on and on...I am also pretty darn bitter that most of my income goes to paying nursery to look after our girls. On the upside, I do get 3 days break from the girls when I am at work. But on the 2 home days, the 3 of us are just so exhausted. The girls are clingly and grumpy and plain hard work. So I get nothing done. I have hardly been near my sewing space in the last 2 months. Frustrating. But, I can't craft when by brain capacity is being abused. No sooner do I get any where near my sewing table and the girls need me. As in Chloe falls off or on to something, or they start fighting with each other, or they need snacks or drinks. It was easy when there was just Ava to entertain, but add a very active Chloe to the mix and it is just too much of a hassle. So, I just don't bother trying to sew or do anything crafty. Frustrating. But. But, but, but, but, BUT! I am on leave until the beginning of September! YAY! 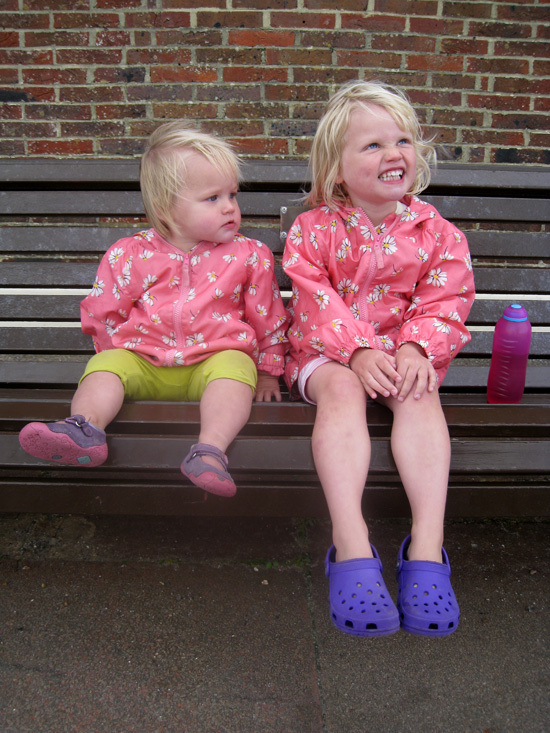 It's only 5 working days, but the girls will be at nursery for those 5 working days. Which means that I can cut and sew and print and design to my hearts content. Now I just have to survive the next few days until my first day of peace and quiet next week. I am counting the sleeps. During May we bought tickets to go home for Christmas. I was last home 3 years ago, when Ava was 6 months old. Flower Daddy was last home when I was pregnant with Ava - so it will be 4 years for him by the time Christmas arrives. Far. Too. Long. My mother has visited us a few times and the Flower Daddies parents have visited once (just as all-day sickness took residence when I was pregnant with Chloe - eugh). But, it has been pretty much 4 years since we saw anyone else. I miss my family. Especially now that we have our own family to share with them. I would love for our girls to have a proper and meaningful relationship with their cousins and aunties and uncles and especially their grannies and grandpa's. For me, about 3 weeks ago, the excitement started settling in. I am now just itch-itch-itching to start packing and to see our families. 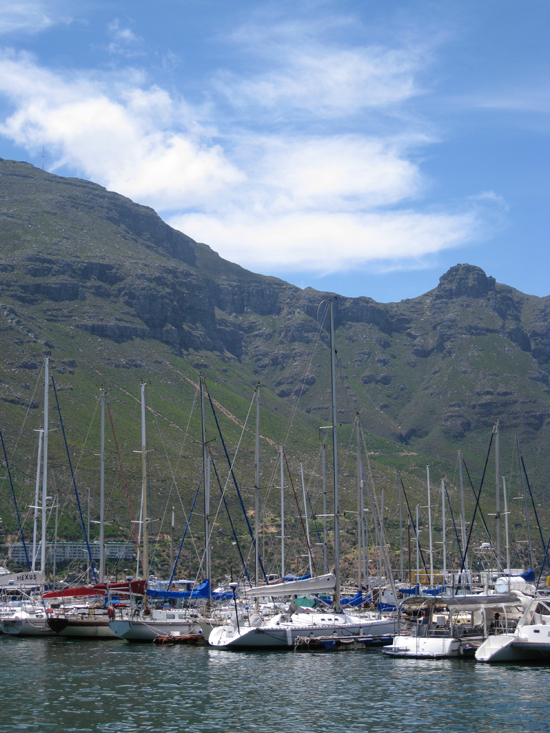 We know that our time away will be crazy and hectic and far too busy to call a holiday. We will, with out, doubt be exhausted when we return. 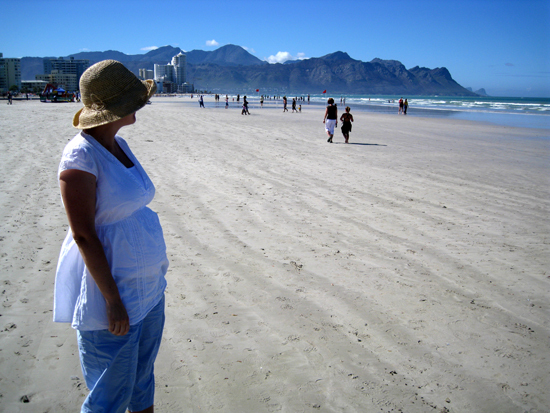 We have 4 different places to visit - (Cape Town, Port Elizabeth, Pietermaritzburg and a teeny weeny town in the Karoo) - 3 of them a 2 hour flight or 10 hour drive (longer now that we have little people travelling with us) away from each other. The fourth being a 4 hour drive away from one of the other places. We know that it will be stupid expensive. We also know that it will be a lot of fun. So now....I am thinking about Christmas presents. They need to be inexpensive, but meaningful. 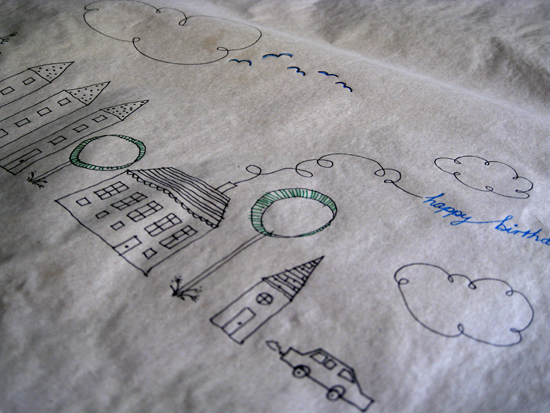 Preferably home crafted. Light-weight, if I am to make them before we travel. 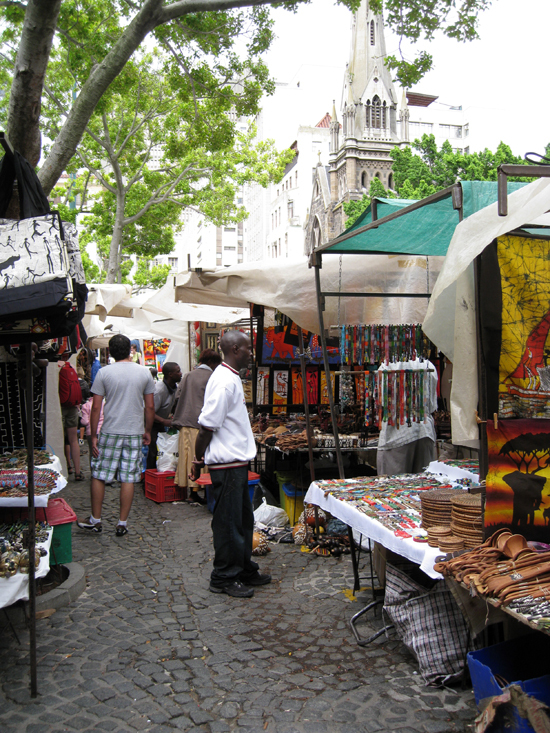 Or simple and quick and very economical to make if I am to make them when we arrive in South Africa. What to make - what to make???? 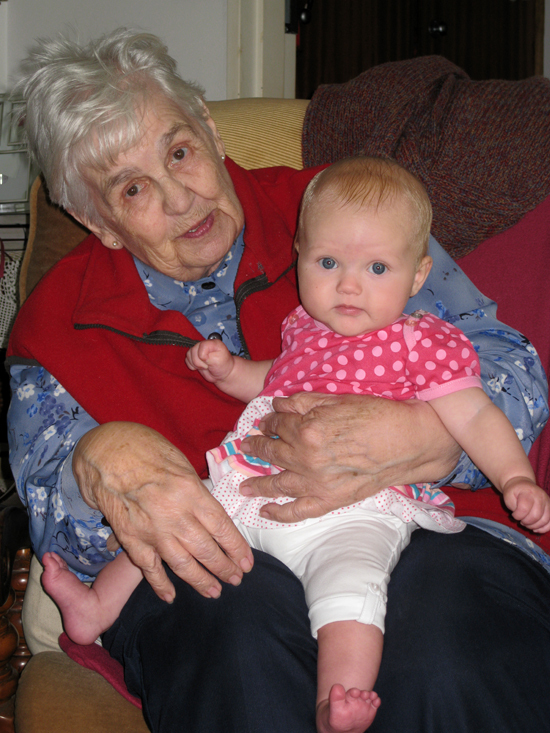 The age range is pretty huge - from 18 months to grannies and grandpa's and a very special 90 year old great-granny. Boys and girls. Young and old. What to make?!? I am thinking that this play mat would be a great idea for Ava and her 6 year old cousin. Doodled key rings or brooches (made from the copious number of wooden coins I still have left over from Ava's memory coins) a la Happy Doodle Land for aunties, uncles, grannies and grandpa's. 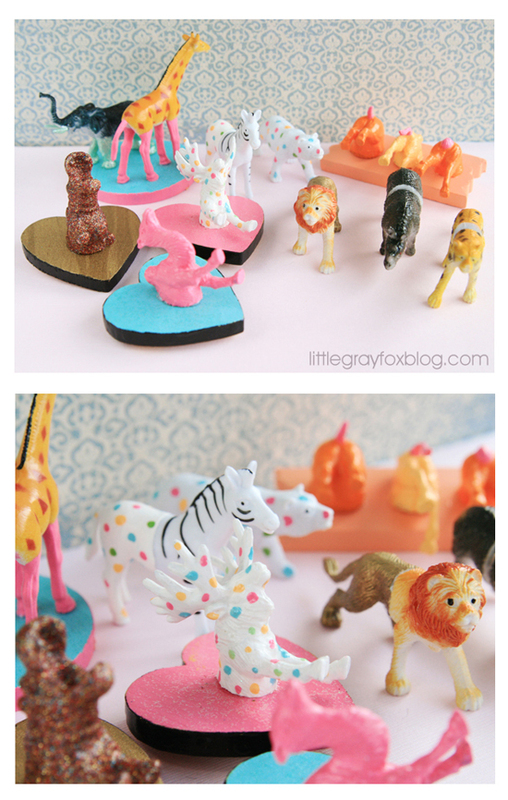 I can think of a little 6 year old boy cousin who would probably love these fun animal hooks for his bedroom...not that I have any spray paint, random animals or wood backing shapes in my craft box! My 90 year old gran loves photo's. So I think a special family portrait mounted in an embellished picture frame would be a good idea (something like this one). Am thinking a simple wooden frame, painted, then colourful buttons stuck all over it. Eesh!...it's a start, but what to do about everyone else? Any thoughts, suggestions or ideas? 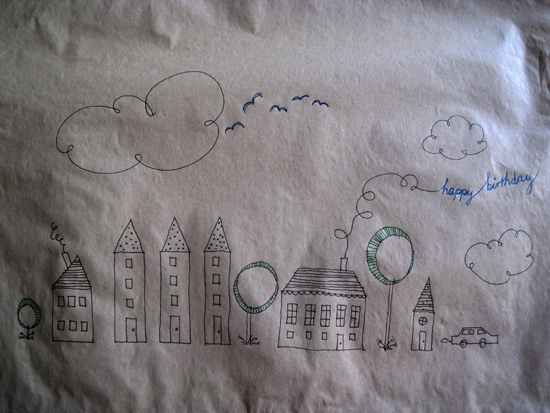 We wrapped his present in a brown paper bag after I drew a simple little picture. The car is a bit dodgy. But, hey ho, the picture is just there to perk up the package...and hopefully make him smile. I would have asked Ava to colour the picture in. 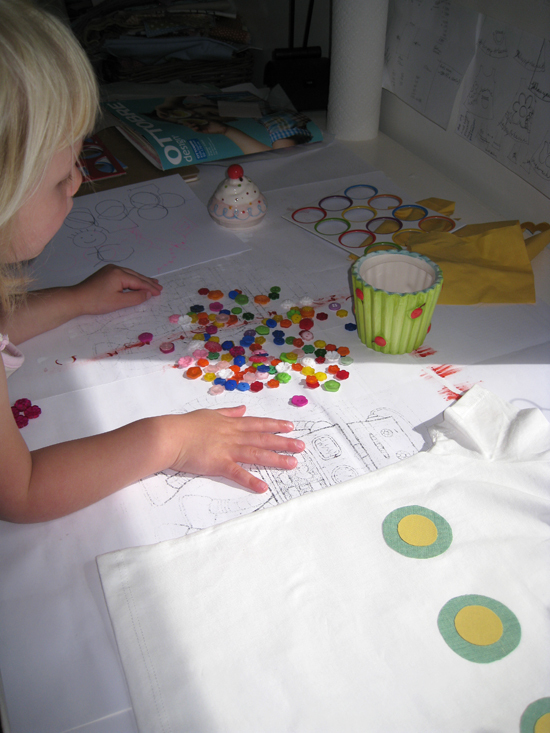 But, her idea of colouring in at the moment involves much dense use of a black koki. Which means that any picture is completely obliterated. I recently bought a few plain t-shirts from H&M with the intention of personalising them for Ava. 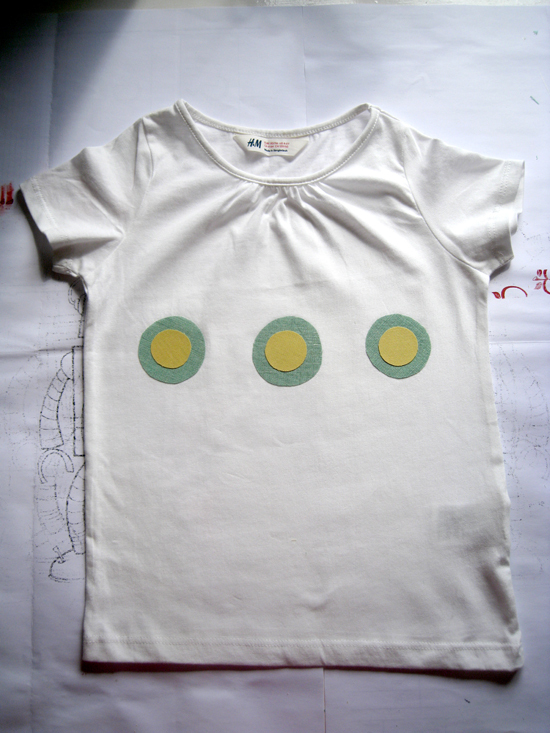 So, here is a t-shirt with appliquéd circles. 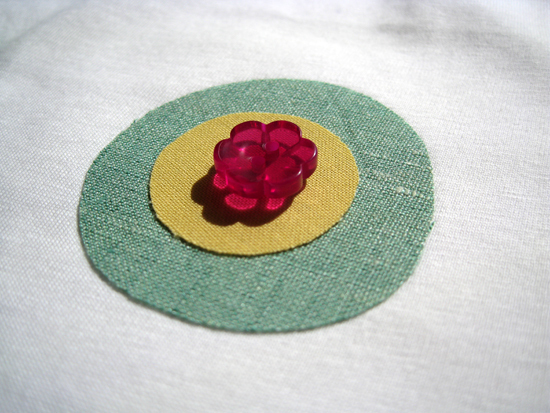 The idea is that when the shirt gets washed that the circle edges fray....hence the name "Scruffy Circles". Draw your circles on to some Wonder Under. 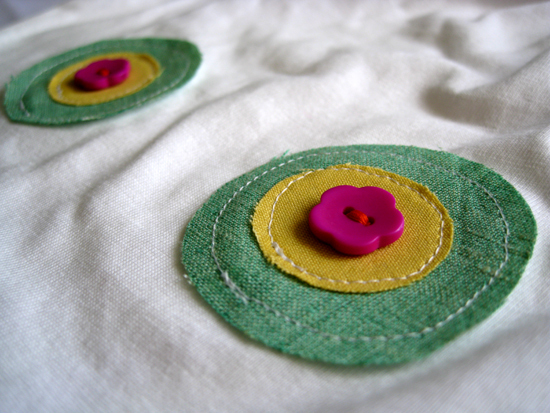 Cut your circles out and iron them on to the back of your fabric, spacing them well apart. 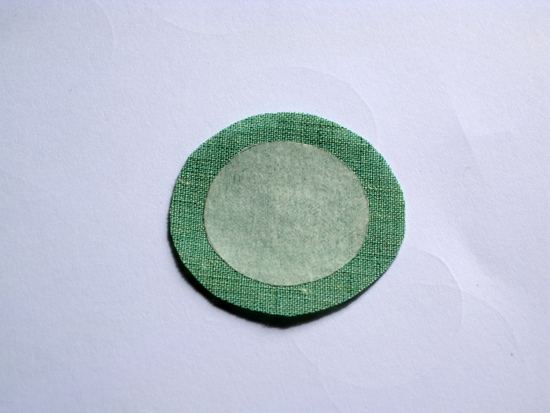 This green fabric is a linen. 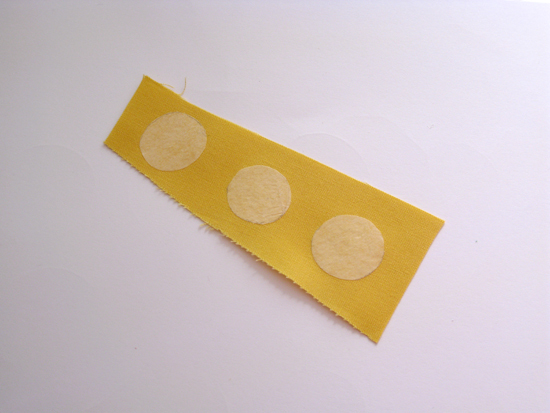 Cut your fabric out about 8mm bigger than your Wonder Under circle. 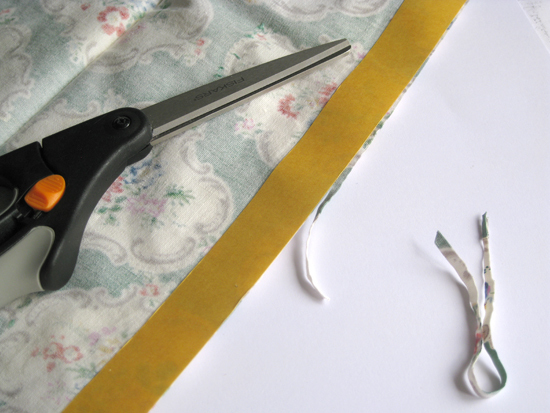 The Wonder Under is only there to keep your bits of fabric in the right place when you sew them down. 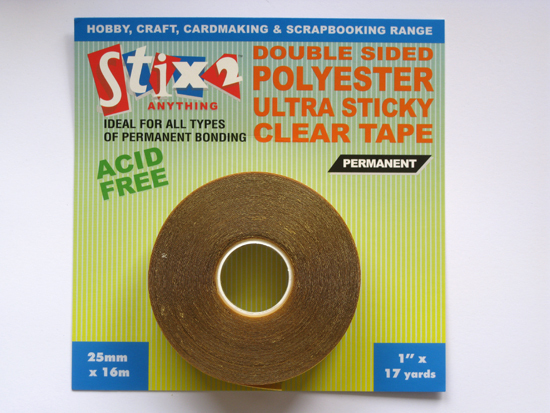 So, really, you could use anything sticky that is appropriate for fabric. Then trace smaller circles on to your Wonder Under. Iron those on to the back of a 2nd fabric, spacing them well apart. 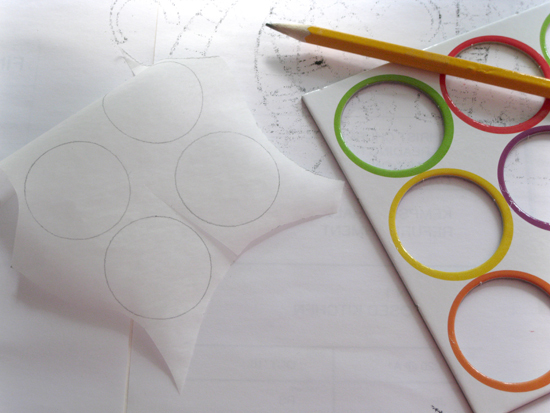 This time cut the circles out something like 4mm bigger than your Wonder Under circle. This yellow fabric is a quilting cotton. 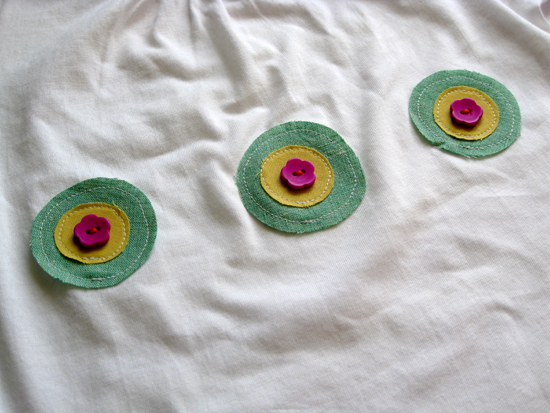 Place your circles on your t-shirt to see how you would like to arrange them. 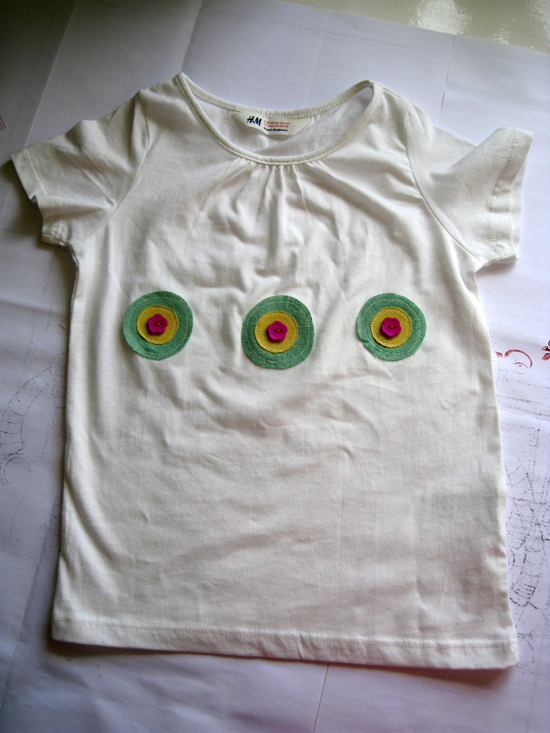 After seeing Ava wearing this shirt, I should have put the circles closer together and maybe also a smidge higher. 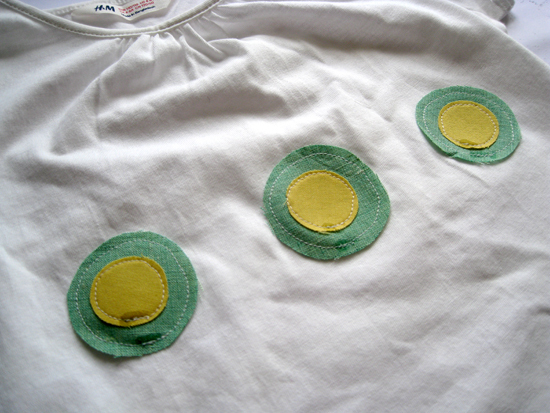 Peel the paper off the back of your circles and iron them on to your shirt. 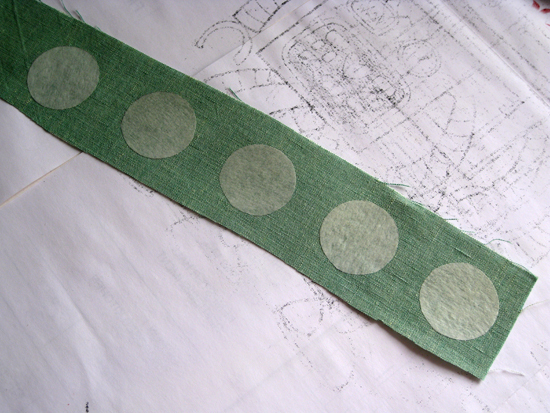 I ironed on the big circles and then the small circles. 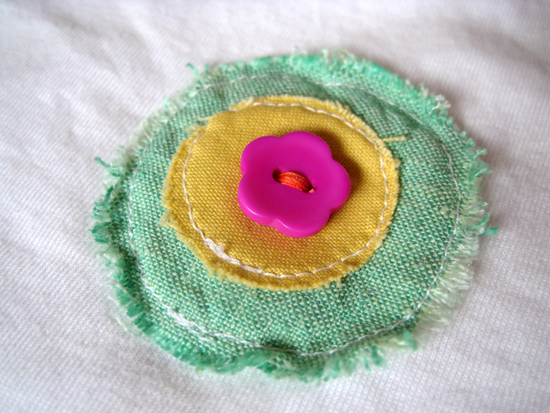 Sew the circles down. 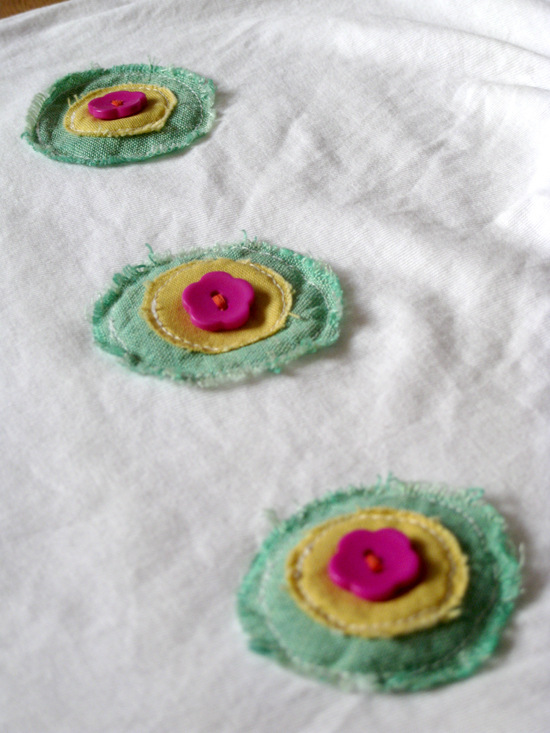 I machine sewed, but you could also sew them on by hand with a back stitch or a running stitch. 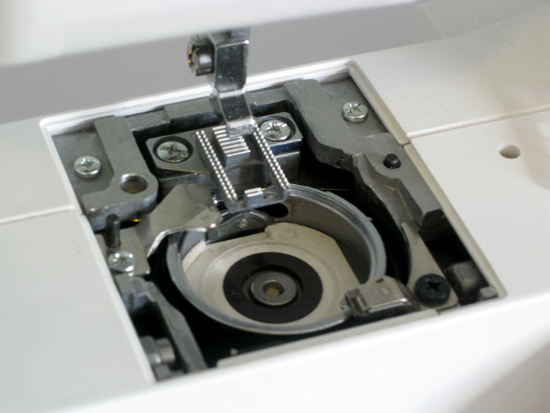 If you are sewing by machine and are able to change your presser foot 'strength', then set it to the lightest it will go. That will make it easy-peasy to sew around the continuous curve. My machine has 4 levels: 0-3. I turned my dial to 0 for this. 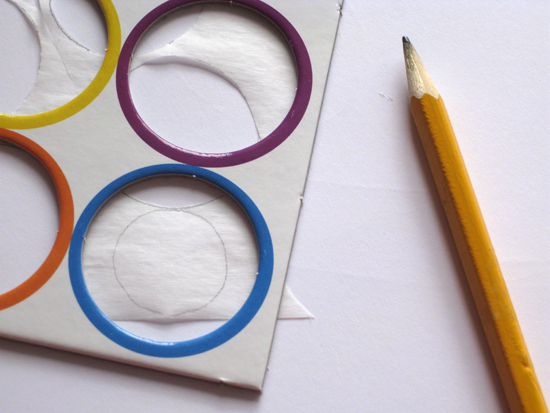 Leave a wider space between your stitches and circle edge on the bigger circle. 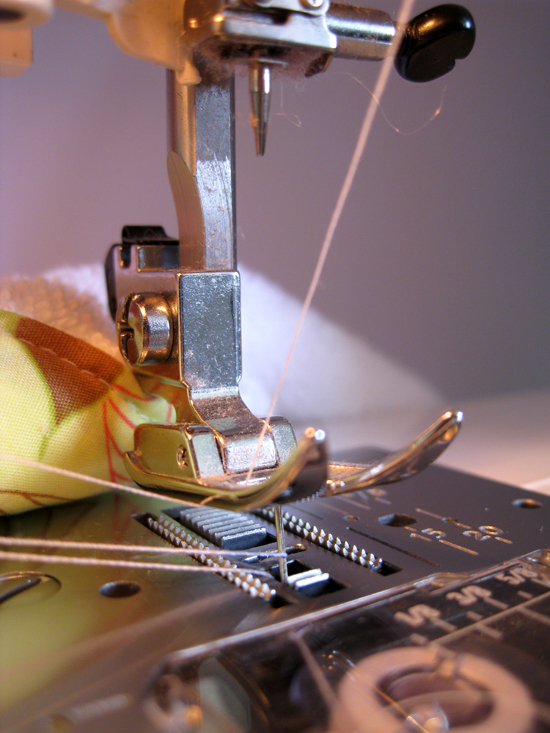 Remember to back stitch at the end. I used a bit of fray stop on my thread ends, just in case. 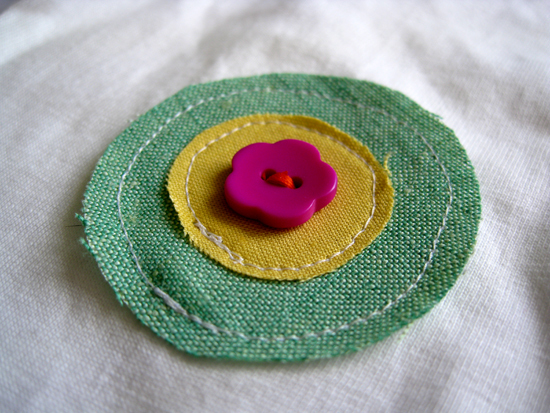 Haul out your button stash and choose some buttons for the middle of your circles. Maybe these lovely pink flowery ones? Nope? Maybe these spotty ones? Nope? Ok...then these pink ones. And we'll stitch them on with orange thread! "Mommy I can feel the buttons". 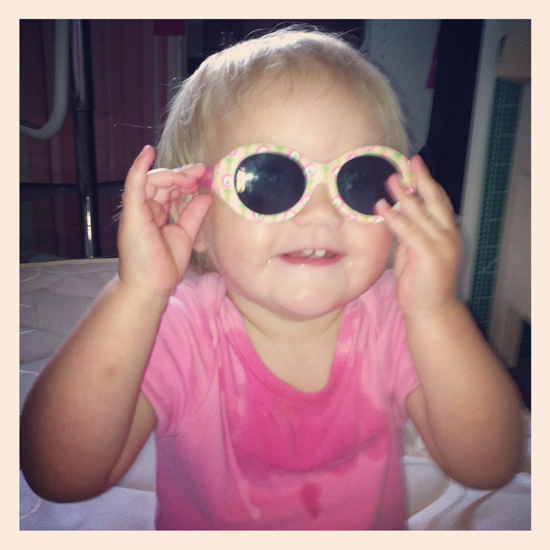 Please tell me that she isn't getting picky about what I do to her clothes already!? 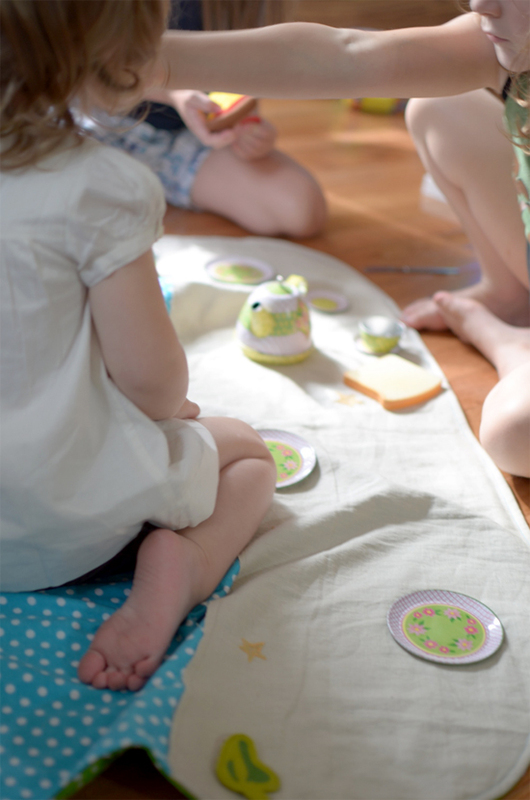 Go forth and get sticking and sewing! Cover the stains on an old t-shirt or decorate a new one...it could be a stripy shirt or a plain shirt - what ever floats your boat! 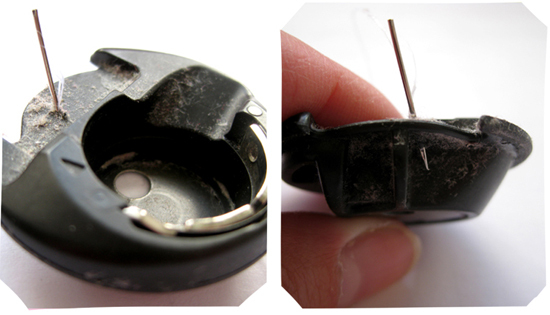 You could even use the same idea to patch holes in pants or shirts. I'll be back to update this page when the t-shirt has been washed! Fingers crossed it doesn't fray into oblivion! The scruffy circles survived the washing machine! Oh boy...I would have felt like a complete idiot if this hadn't worked. I am really pleased with how these have turned out. I think that I am going to try a heavier weight fabric next...maybe a denim? If you give this a try, I would love to hear how you got on.